Posted on December 12, 2006 by Alicia Bay Laurel	in Blog. I hadn’t seen Karin Lease in a couple of years, but I love to visit her. 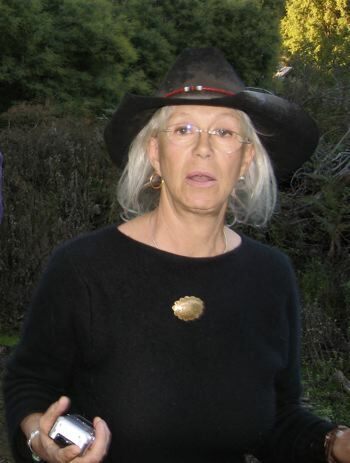 She was my dear friend when we lived at Wheeler’s Ranch commune in the late 1960’s and early 1970’s. She’s really something. As Anitash Designs, she makes fabulous costume jewelry and clothing. As wildflower revolution, she’s reknowned as an environmental activist. The first morning I awoke at her house near Sebastopol, California, dawned bright and balmy, and I had no trouble convincing Karin to come with me to Wheeler’s Ranch for a walk in the forest. 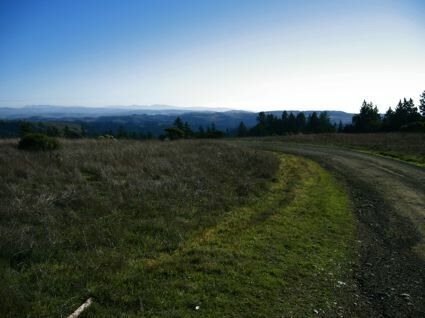 Once the only commune in the area, Wheeler’s Ranch is bordered on two sides by large communes, Oceansong and Star Mountain, and a third large communal land, Bodega Pastures, lies a few miles away to the south. This view is from the top of the land at Oceansong, looking south. Mount Tamalpais in Marin County is on the horizon. 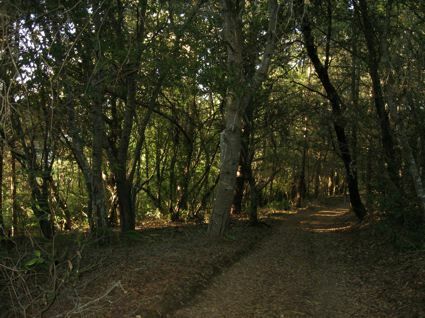 We walked along the familiar forest road through Wheeler’s Ranch. 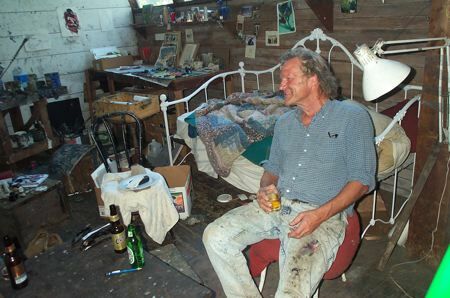 Today the commune consists of a dozen households that pay rent to Bill Wheeler, who lives on the land and enjoys a considerable reputation in the San Francisco Bay Area as a plein air painter. 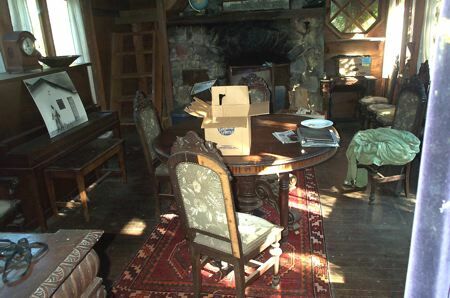 We stopped at Bill’s wonderful homebuilt cottage, built of his own hand-milled timber, and complete with stone fireplace and antiques from his Connecticut ancestors. Bill Wheeler was surprised and happy to see us again. He said that a film crew was due any minute to interview him for a documentary, and that, no doubt they would want to interview me as well. Karl Ferris and his wife Melanie have a grant from the Canadian Film Board to make a documentary on bohemian life, and, yes, they knew about my book and were delighted to interview me. Happily, I had some of my books and CDs in my car, so that they would be able to use images from Living on the Earth and songs from Music From Living on the Earth in the film. 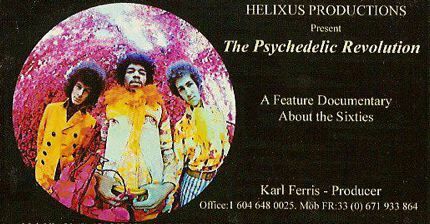 Karl took this famous photograph of The Jimi Hendrix Experience, and it’s on the business card he gave me. 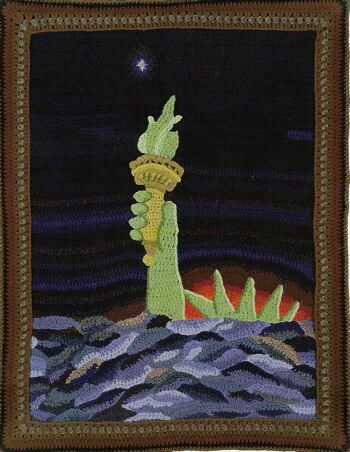 Birgitta gave me this photo of one of her amazing crocheted wall hangings, bought my book and CD, and regaled me with wonderful stories. I’m invited to visit her in Santa Fe, New Mexico. 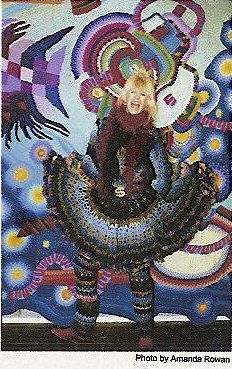 Below, she dances in one of her crocheted costumes in front of another crocheted wall hanging. Her work makes me think of Simon Rodia and of Antonin Gaudi. I had fun doing the interview, and I’m told the film will be released next summer. 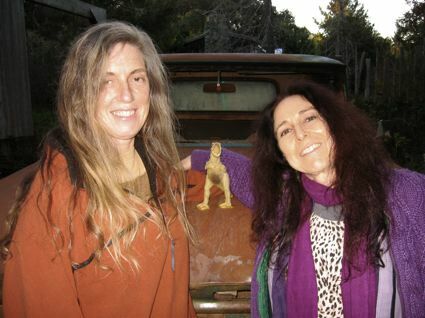 Karin and I walked back up to my car at Oceansong in the waning light, happily illuminated by a fat full moon over the forest.